El Nino x Sub-Zero lines! Wow! After shearing. Looking great. Bella, under a week old. Bella was aptly named as our Beautiful Bella on the day of her birth. Bella took first place Bred and Owner light female at the Rail Splitter Alpaca show only 2 days over 6 months of age! The judge raved about her BRIGHT fleece and fantastic consistent crimp! A first place at the Alpaca National Show, Railsplitter, and Illinois Alpaca Fiber fest in 2018! We are so happy with how this young lady developed. Her dam, Ishsha is known for producing phenomenal cria with perfect conformation, fantastically fine fleece and consistent blankets. This is no surprise given Ishsha’s lineage. She is the product of a Mister Antonio daughter, bred to El Nino producing an outstanding female who was then bred to Don Quixote leading to Ishsha. Legendary champions at every level of her pedigree and took a blue ribbon herself at 7 year of age. We crossed these genetics with none other than Snowmass Moondance himself! Yes, the First Place two year old male in the 2010 Futurity. 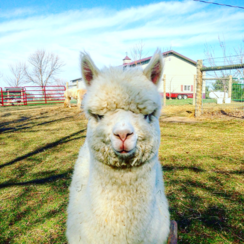 Moondance’s Dam, Snowmass Freedom is one of the most valued white females that Snowmass Alpacas has produced. His maternal brother via Snowmass Freedom is Snowmass Defiance who won Supreme Champion in 2013 at the International Show. The excellence is most certainly heritable from this Grand Dam along side the others in his pedigree. Fantastic genetics and a wonderful personality. Here at Sundrop, we breed for show quality excellence but treat all of our alpacas as family.